So, don’t be afraid! 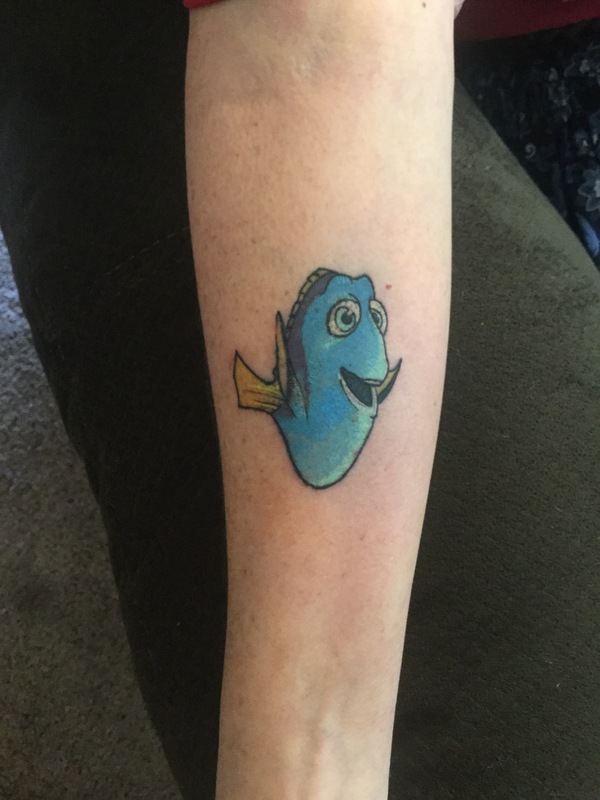 Be strong, be courageous, and keep on swimming, even if you feel like you’re a ditzy dame like me! You have something important God wants you to contribute. Just do it! Happy Memorial weekend and happy Sunday! There are many types of loss and grief. Most of the time people think of loss in terms of losing a loved one through death. That is a major loss, but we suffer grief at other types of loss as well. We may suffer loss and grief when we lose a job or change jobs. We may suffer loss and grief as we age. We may suffer loss and grief after a romantic breakup or marital divorce. We may even suffer loss and grief due to children growing up, losing pets, or moving to a new home or a new city. I’ve gone through loss and grief periods in all of the ways that I listed above. None of them are easy and none should be made light of just because someone else has never dealt with that kind of loss. Your loss and you grief is valid if for you it is impacting your daily life. What do we do with loss and grief? There are no magical “abracadabra” ways to remove loss and grief from our lives because they are a part of our lives that we can’t escape from. I don’t know anyone who has never experienced loss and grief in some way. Since there is no magical way to just make it go away, we must find ways to deal with our loss and grief so we are able to go on with our daily lives, meeting our responsibilities and letting those around us know we love them and need their presence and care during this difficult time. Some healthy ways to deal with loss and grief include journaling each day to describe your feelings and thoughts. If you miss someone, you might write them a letter in your journal to express that. If you’re feeling particularly sad one day, you might journal about those feelings as well. You can even write prayers and gratitudes in your journal as your journey through this time of grief and loss. For people of faith, prayer and meditation are often very comforting during this difficult time. Many times we get angry at God for our loss, particularly if we’ve lost someone to death. We don’t want to talk to Him because we’re afraid we’ll lose our temper and say things that will make God mad at us. I have shocking news for you. God can take it! He knows we get hurt, angry and upset with Him. He would much rather hear our true feelings toward Him than for us to remain silent and cut ourselves off from our relationship to Him. There are many examples of people getting angry at God in the Bible and God answering that anger with love and grace. A perfect example of this can be found in Jonah, chapter four. Jonah was angry at God in that instance because of God’s compassion on the nation of Nineveh. How did God respond to that anger? He caused a tree to grow up over Jonah where he sat pouting angrily at God so Jonah would be in the shade! I received no immediate answers. I was met with silence. Then, and this may sound like an odd way to deal with grief, but I watched a Cary Grant marathon of movies all day on New Year’s day, mostly by myself. (Cary Grant had died the same year my brother did, hence the marathon.) I sat in front of that television and watched movie after movie. I cried, I laughed, I cried some more. I got lost in some of the movies and forgot my grief for some moments. Some of the movies brought the grief back so freshly I was sure my heart must be bleeding inside. Finally, at the end of the day, my emotional well was completely empty. I had cried myself out. The next day I got up and took care of my family. I still had grief over my loss, but I had expressed it so thoroughly, I felt cleansed of the deepest parts. Over the years, that grief has resurfaced many times. I still miss my brother. I can’t wait to see him again in heaven, but today I can deal with it. It has been 29 years since I lost my brother. I still don’t know why he was taken home early, but I do know that our love endures somehow. I know I still love him and? that he still loves me. In that way, he is always with me. This eases my grief immensely. How do you deal with grief? Do you push it down inside and try to ignore it? Do you get angry and take it out on family and friends? Have you allowed it to take over your life so you’re stuck in it and can’t seem to find a way out of it? If so, let me assure you there are healthy ways to get unstuck. I wouldn’t recommend a Cary Grant movie marathon, but there are ways to deal with your grief and continue forward on your journey. There may even be times when you remember the love that you shared with that person and feel joy. I’ve been maintaining two blogs, one of them being Pocket Full of Words and the other being Finding Joy. I’ve discovered that the Finding Joy blog isn’t one I update often and more frequently connect with people in that capacity (inspiration and informal transitional life coaching ministry) on a FB page by the same name. So, long story short, I will be importing the blog posts I had on Finding Joy to Pocket Full of Words and then deleting Finding Joy. As I move them over, you can read what you want and leave the rest as the old saying goes! I hope all of you have a pleasant week leading into the Memorial Day weekend and I’m sure I’ll be posting some more poems here throughout the week! I doubt you want more. As I went down the canned goods aisle at an old-style A&P grocery story in Amarillo, Texas, looking for chili, suddenly an elderly woman’s voice from behind me says, “If I weren’t any bigger than you, hon, I’d be ashamed to be seen in public!” As I turned around to find the source of the voice, I saw the woman who made this pronouncement, and realized she was talking to me. Although the words could be taken as rather malicious, the smile on the woman’s face quickly made me realize she was teasing me. She was smaller than me, hunched over, with an outfit on that my mother would have worn were she still alive: light spring green polyester pants and a striped short-sleeved cotton shirt to match. Her hair was in pink foam curlers and I wondered how long she had worn those curlers. Did she ever take them out? She leans into me as the young men leave, “I know those boys, all of them. They live on my street and nicer young men you could never find! They take care of my lawn, take out my trash for me, and last month when I had pneumonia and was in the hospital, they even took care of my little Freddy. Freddy is my little mutt dog that means more to me than life! Yeah, they’re good boys. Now, what about you? Tell me about yourself. I don’t believe I’ve met you before!” We talked for about 10 minutes, laughing, and generally making each other happy just by taking a few minutes to connect, to get to know one another, if even just for a few moments. Finally, seeing my husband waiting for me at the end of the aisle, I realized I needed to get what we came in for, and go back to the small, old Route 66 motor court (motel) we were staying in for the night. “Well, ma’am, I guess I better be goin’! We just came in to get some food for lunch. Is there anything I can do for you before I leave?” “Oh child! Not a thing, not a thing! You already helped me by stopping and talking to an me, laughing with me, and giving me a hug. You’ve been a light of sunshine in my day that I really needed.” I gave her a real hug then, feeling her pink rollers under my chin as I hugged her gently. She was so tiny, she looked like she would shatter if I hugged her very hard. “Well, you take care now, ok? You made my day too! I love you!” She got teary eyed and replied, “I love you too, you little bit of nothing!” I hugged her again, a lump in my throat as I grabbed the can of chili I came after, and hurried down the aisle to join my husband. “Oh, God just brings them on my path anywhere I go! She was very sweet and reminded me a bit of Mother so we just talked for a little while. Did you get the bowls and plastic ware we need for the chili?” So we went on with our day and the little lady I had met, who put sunshine in my day, went on with hers. “You know, sometimes God puts angels in our path to cheer us up! I think I met that woman just for that purpose, to cheer me up!” My whole day was better for having met the cute and feisty lady with pink hair curlers and I thanked God for her as we left the store. This is a true story that popped into my head this morning as I awoke early in the morning. I’ve never forgotten this woman nor her laughter and sunny, generous nature. I thought I was brightening her day, when all along, she was brightening mine. It was Christmas Eve, late in the evening, when I realized there were still some things I needed to buy for Christmas dinner the next day so my sons and I drove over to our regular Walmart. The store aisles weren’t nearly as congested as I expected, but did look like someone had thrown a hand grenade in the middle just to see what would happen. Every aisle looked like it had been looted. Shelves were fairly empty, stuff was all over the floor, and it was a mess! I didn’t even head over towards the toy or Christmas sections of the store because I was afraid those might be where everyone was located given that the parking lot was full and the east side of the store, the grocery section, was so quiet. I hurried through the aisles, trying to get everything as quickly as possible, because I wanted to do a little baking that night before I went to bed. We were living with my dad then, partly to keep him company after my mother passed away, partly to combine household expenses to a more economic level for both of us, and partly to watch after my dad who was getting a little bit forgetful and confused. He would receive the bills and I would write the checks and pay them. He was so afraid he’d forget to pay a bill that on the day he received a bill of any kind, the moment I walked in the door, he’d hand it to me and have the checkbook waiting on the kitchen table for me to write it out and put the payment out on the mailbox for the next day’s mail. Besides being a little forgetful, he had macular degeneration so could only see the periphery of everything, which greatly limited him for many things. After I picked up all I needed in the grocery section, my sons and I met at the front and found the shortest line, but still had about three people in front of us, some with groceries, but most with toys or gifts of various and sundry types. The register clerk seemed to be moving rather slowly so the person right ahead of me, snapped at her very rudely. I hate seeing this happen ever and usually try to lighten things up when I get to the clerk. I felt badly for obviously reopening a very new wound, but as the silence stretched between us for a minute, I could tell she really needed someone to just listen to her. I gently said, “What’s wrong, hon?” That’s all the encouragement she needed. “I was working this part-time job at Walmart just to make extra Christmas money so my kids could have a good Christmas this year. I’m a nurse at ** Hospital and I just found out this morning, with no prior warning, that I’m being laid off, effective today! What in the world am I going to do now? This part-time job at Walmart isn’t going to support me and my kids!” Then she started crying in earnest. She had finished checking out my items and I had already paid, but felt she needed a few moments more. I had just learned of the layoffs at the hospital on the evening news a couple of hours before. They were letting over 60 people go due to budget cutbacks. No warning had been given, although some of the employees had heard rumors. This young woman had obviously not heard the rumor. My sons had already gone outside. They were embarrassed, I think, by one more instance of their mother getting caught up in an emotional moment with a total stranger. I gave the clerk one last hug and then followed them outside, tears rolling down my cheeks. “Mom! What are you crying for and what took you so long?” I pulled out a tissue to wipe my face, handed off our shopping basket to one of them and as we headed for the car, I told them about the clerk’s predicament. “You know, boys, I just received my Christmas present for this year. I was honored that she talked to me and that I could be there to offer her encouragement and hope. You know we’ve been in dire straits before and people have popped up out of nowhere to help me all along. It was nice to be able to be the person offering help and hope for a change. Besides, your mom is a crazy lady who loves to talk to people! You should be used to it by now!” We all laughed as we got into the car and drove away.